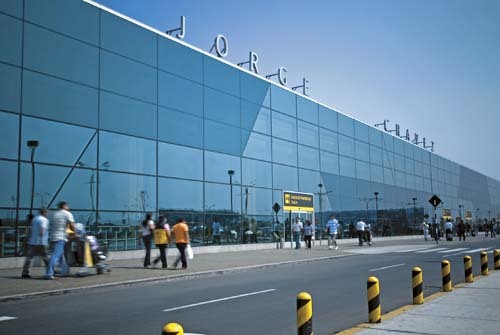 Close to 40,000 flights annually operate on the route between São Paulo's Congonhas Airport (CGH) and Rio de Janeiro's Santos Dumont Airport (SDU). 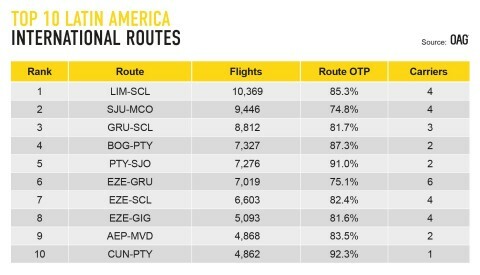 Service from Cuzco (CUZ) to Lima (LIM) ranked 13th among the world’s busiest domestic routes with 32,095 flights followed by Bogotá (BOG) to Medellin (MDE), which ranked 15th with 31,279 flights. “Demand for air services in Latin America continues to grow, with passenger traffic up 3.7% over last year,” said John Grant, senior analyst with OAG. The busiest international route originating in Latin America is Lima (LIM) to Santiago (SCL), with 10,369 annual operating flights. Flights departing from San Juan (SJU) to Orlando (MCO) ranked second with 9,446 flights, followed by service from São Paulo (GRU) to Santiago (SCL) in third (8,812 flights). Most of Latin America’s busiest international routes achieved an 80%-or-above in time performance (OTP) — a notable accomplishment considering the region’s increasing congestion and passenger growth. Specifically, the region’s busiest long-haul routes, São Paulo (GRU) to Panama City (PTY) and Panama City (PTY) to Santiago (SCL), recorded OTPs of 89.4% and 85.8%, respectively.